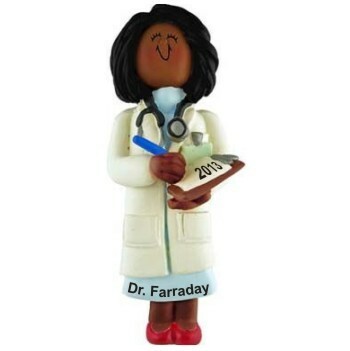 Let your doctor know just how much you appreciate her wonderful care of you and your family with the African American female doctor personalized Christmas ornament. It's also a great way to honor a family member or friend who has entered practice as a physician. Our calligraphers will add the doctor's name and the year to this ornament, one of our large selection of African American ornaments celebrating careers, education, family events and much more. The female doctor personalized ornament is shipped in our exclusive velvet gift and storage bag.